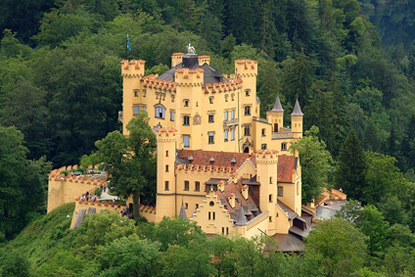 Dating from the in the 1830's, Schloss Hohenschwangau was one of Germany's first castles of the Romantic movement. It was the childhood home of Ludwig II of Bavaria and was built by his father Maximilian II, above the ruins of a medieval castle. The castle is open daily from 8:00 am to 5:30 pm (9:00 am to 3:30 pm from 8th October to 31st March). It is closed on 24th December. Admission costs 12 € for adults, 11 € for students and seniors (over 65), and free for children until 18 years old.